Have you had an urge to create something magical but think you don't have what you need? Bringing your imagination to life isn't dependent on the availability of tools, materials, etc. The real magic happens once you can see the possibilities in what seems unremarkable and recognize how to harness the power of the materials that you do have access to. Building a fairy house doesn't have to be complicated or expensive. Watch to see a discarded clock converted into a magical space using a few tools, a little time and big imagination. I'll let you in on a little secret, I LOVE to build stuff. What kind of stuff? All kinds of stuff except for electrical...only weirdos enjoy electrical. While I've been building all sorts of things for a while, I've been messing things up for even longer. The first playhouse that I built looked awesome, but it fell over the first time Parker opened the door. Here's the thing, creative expression (however you define it) is not necessarily dependent on skill level or specialized expertise. I believe that willingness is where all creation begins. Willingness to try. Willingness to fail. Willingness to be keep at it. For me, the LOVE that I have for building stuff is a really about the process of creating something, particularly something that makes someone else happy. So what does any of that have to do with learning to build a door? Far too often, people say, "I could never build something like that." That will only be true if your unwilling to try. Some of the most amazing creations are the culmination of a myriad of beautiful mistakes. So grab your drill, borrow a saw, and pull that wood out of the dumpster and create something magical. Parker and Tyler provide an update for our little family since leaving Overland Park, Kansas. With all the tragic things happening in the world right now, Snowflake decided to take a trip down to Texas and then Florida to check in on her fairy friends there. She plans to help where she can before returning home. Her gnome friend Fiona graciously offered to watch over her home with Fizzles while she is away. The kids and I got to thinking that we could also do something to help others in areas recently affected by natural disasters. We have been sorting through the books in our house for the past few weeks and are in the middle of planning a book sale! All proceeds will be donated to humanitarian aid and we are excited to let Snowflake know about what we are going to do! Lark had to take an extended vacation with Twanda Bell to take her newly trained pets (Blackey the Spider and friends) to their new homes. She even took her furniture with her so she could set them up while she was on vacation. She was gone for a few days and we sure missed her a lot. We checked her house everyday to see if she'd returned or forgotten any of her spider friends and just when we thought she wasn't going to come back Vivian returned home from school to a giant surprise. She could hardly wait for the garage door to open so she could run out and inspect the new addition to Lark's House. Right next to the wishing well a beautiful blue flower that dances in the wind had sprung up. The girls ran to inspect it and saw that it was covered in "Never Crystals" from Fairy Land. After quite a discussion on how it came to be there, they decided that Lark must have planted a wish from the wishing well and it grew into a beautiful enchanted flower. What I've come to learn about fairy magic, is that it is an amazing teacher. As the "grown-up" watching this unfold for my little girls, it's hard to see them sad when something happens like Lark's pets leaving. While I know that they loved them, it just wasn't safe for them to stay (what kid loves spiders anyway, ick)! As I was thinking about Vivian and the spiders, I couldn't help to think about the situations in my life that were the same. Maybe there are things that I'm sad over, that if I just knew a little more information it would make more sense. Maybe there are things that I want to be different, but it just isn't the right thing for now. While I may not always understand the reason, maybe if I can step back and plant a wish, something miraculous can grow out of it. I'm grateful for the magical flower that joined our home today, what an awesome symbol of hope growing after a loss. So thank you to all the fairies that have provided the magic in my home that continually teach me about gratitude, miracles and allowing space for magic to happen. Now that Lark is a permanent resident in our neighborhood we have seen an increase in creature sightings. Vivian is convinced that Lark has been sharing her fairy talents with her and she is now an animal whisper too. She has had a wasp land on her hand and not sting her, grasshoppers have happily let her hold them and we even found two giant caterpillars this morning. We are so lucky to have an animal talent fairy nearby to help tame the savage insect world that seems to be invading our home. Who knew we would learn to love all the creepy crawlies that used to make the girls shriek? Unfortunately one of Larks favorite pets recently has been spiders and just like Vivian, she wants all the creatures she finds to come home and live with her. Larks house was starting to get full of spider lace and while Vivian thought it looked beautiful, we thought it best to clean it out so that Lark could get up are stairs without getting caught in the webs. We discovered that Lark had more than one spider pet living with her and they were super shiny black ones with pretty red hourglasses on their stomachs. We had a lengthy discussion about how Lark was able to work with creatures that aren't safe for little girls and if we see spiders with red on them to leave them alone and not try to pet them, even if they are pets of our favorite fairy and she shares her animal talents with us. Luckily while Vivian was at school today, Lark finished training her spiders and sent them to live in new homes. I'm crossing my fingers that the next animal she trains has a few less legs. 415 Rebelberry Way - Where do Fairies Come From? Is this the direction from which the fairies come? Could this be where they're from? I'll slip a note asking them, under their front door! 249 Cranberry Lane- Cup of Tea? Alice set up a Tea party at her friends house to cheer her up! What a great friend she is. What can you do for someone to make them smile?? Have you ever wanted to change how you see the world? Watch the video and discover how you can see more magic using a new lens. 249 Cranberry Lane- Back to school! Who knew Fairies love school! I think they are happy and grateful about everything. Alice not only brings joy to us and all those who visit her but she teaches us that having a good attitude about life makes things easier. Our family went on a camping adventure last week! The girls asked if they could invite Snowflake to come along and when I agreed they wrote her a note and left it in her mailbox. Snowflake didn't give us an answer before it was time to leave, but when we arrived at our campsite one of our friends got to work making Snowflake a "tent" of her own...just in case. 415 Rebelberry Way - Take a Look Inside! Is a wonderland the size of a mouse! It's amazing in here, come see it all! Filled so tight with a tiny fairy glove! The fairies will send their magic your way! Oh man! Garden vegetables! Cup cakes! She's the best. I wonder what she is saving for?? 249 Cranberry Lane- Happy 4th of July!! We were so excited to find out that Alice loves the 4th of July as much as we do! She demonstrated some of her BBQ'n skills! We couldn't stop smiling all day after we saw her celebration display! Alice makes us and other that visit her home giggly. We love her. Look at that cute little grill! We love hotdogs TOO!!!! 415 Rebelberry Way - A New Fairy Has Arrived! those with feet and those with wings! to visit this house where the fairies are! keeping watch over this beautiful house where friends meet! the light shines just right and sparkles on the lawn! a house has come for those magical things! 415 Rebelberry Way - AWAITING AN ARRIVAL! when their home arrives, the fairies can play! and what goes on through the fairy house door! we hope this excitement never ends! Such exciting news! We have a new fairy in our neighborhood! 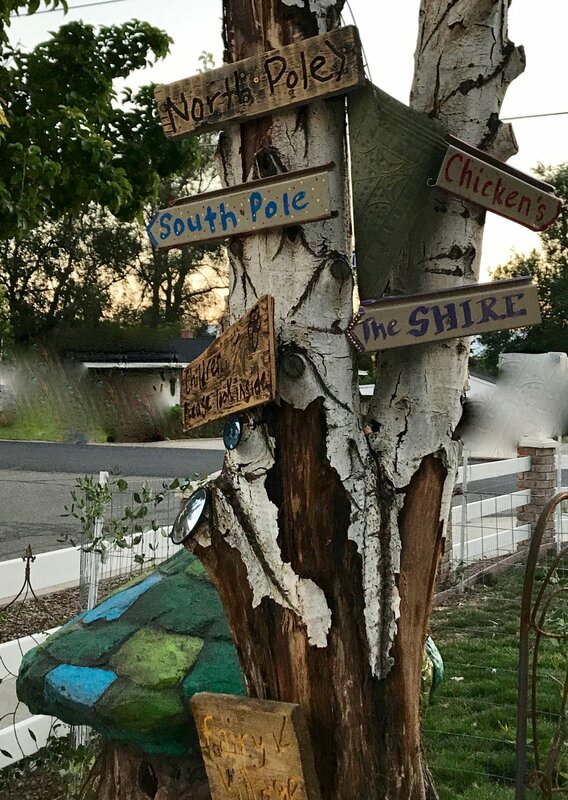 We returned at dusk from a get together with friends and to our amazement there was a new fairy house where the sign used to be! Vivian could not contain her excitement as she ran out to look inside. Violette had fallen asleep in the car but in the morning Vivian was more than happy to take her out to look inside their newest neighbors house. It is A beautiful two story home with a staircase the circles up to the bedroom. Cute little lanterns glowed in the night on the cupboards. It has a little pantry and a table and chairs with a cute little book. We can't wait to find out what talent the new fairy has and her name! We discovered over the past few weeks that Alice loves to cook! In fact I think that is her main talent. Everyone here in the Clark house hold thinks she is traveling to learn new ways to cook. Sometimes we wish we were tiny like the fairies so we could be apart of meal time. Who doesn't love breakfast?! Firefly Forest Doors are like portals to new worlds and are beautiful symbols for life's most significant passages. These lovingly hand-crafted doors make wonderful gifts for birthdays, weddings, bar mitzvahs, and any occasion celebrating stepping into new realms and new experiences. Select your special door today!